The AdStage platform is built to meet the needs of every type of marketing team. Whether you're a one-person show or part of a large agency, you can use the Account Visibility Toggle to customize your views in AdStage. Account visibility affects what you see while working in AdStage. If an account is invisible, it means that you will not see this account or any of its entities (campaigns, ad groups, etc.) in the platform. The exception is if you set a widget to show 'all' accounts/campaigns etc, then data from invisible ad accounts will be included. Account visibility lives at the user-level in AdStage, which means that one user's visibility settings will not carry over to another user's in the same organization, or company. 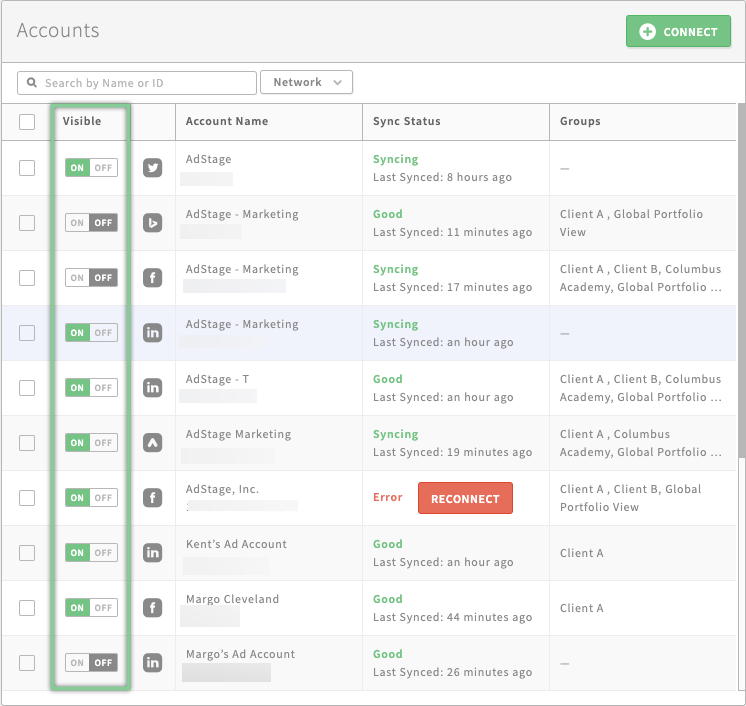 Each team member may edit the visibility of the Agency's full account list to only show their own accounts or account groups. Team members may edit the visibility of certain accounts while they work in AdStage depending on their focus at the time. For example, some marketers may want to spend the day focused on domestic ad accounts vs. international ad accounts.